Valet Parking, or Meet and Greet Parking is the most convenient way of parking your car at Manchester Airport. Let a trained driver take your car and park it for you while you walk straight into the terminal. On your return, your vehicle will be waiting for you outside arrivals. Meet and Greet parking operates from all 3 terminals at Manchester - ideal for all customers. Take a look at the different valet parking options available at Manchester Airport before booking online today. 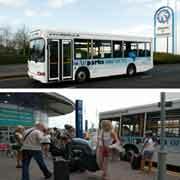 Airparks® also offer Manchester airport hotels with parking for a most convenient and stress-free method of traveling. Perfect for late or early departure times, hotels and parking at Manchester is great value and costs less than you might think.